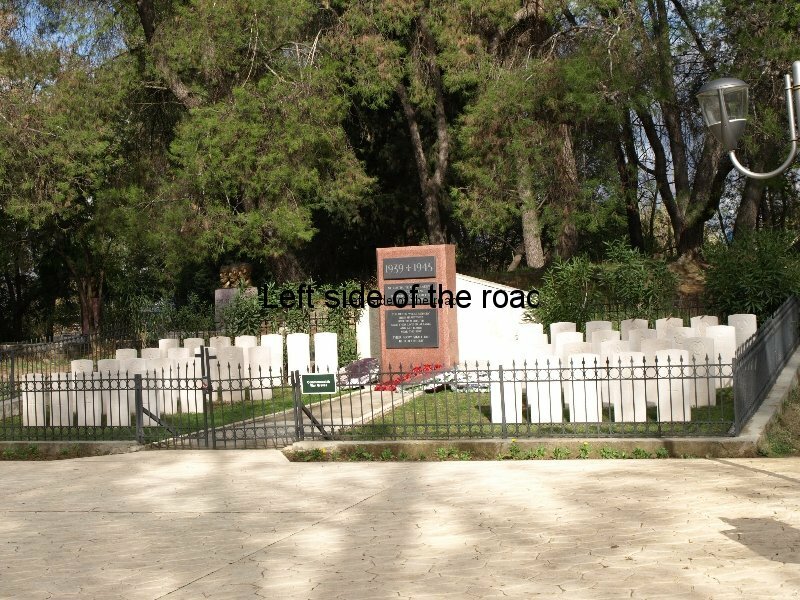 On Sunday 11th November 2012 the British Embassy organised a Remembrance service at the English Cemetery in Tirana Park, behind the State University, in the centre of the city. There were few people in attendance, as the English community in Tirana is relatively small, but included the British Ambassador and the Prime Minister of Albania, Sali Berisha. This is not an uncommon occurrence in countries which fought against Fascism in the 1930s and 40s but in Tirana such an event is loaded with a political significance that goes beyond commemorating the ultimate sacrifice of young men. Albania was never a significant theatre of war for the British armed forces, although for the intelligence community the country was important from the very beginning of the war and they were always looking for a way to influence the eventual outcome of the conflict. This primarily, until the German Nazis were on the point of being thrown out of the country, meant war supplies being air dropped into the country under the auspices of the SOE (the Special Operations Executive). After the war it was officially dissolved but its operational expertise was absorbed by MI6 in its anti-Communist activity during the Cold War. However, this war grave has only existed since 1995. 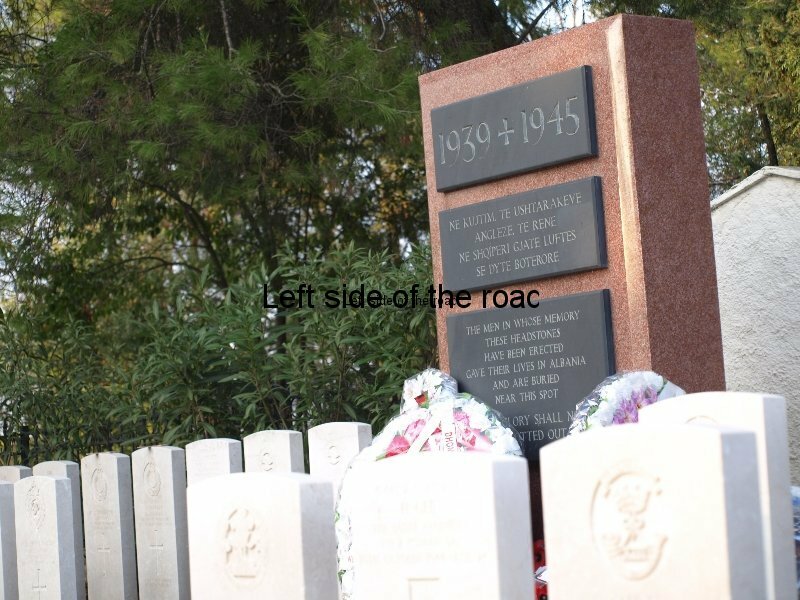 As the Commonwealth War Graves Commission states the ‘political situation’ at the end of hostilities (and continuing until the early 1990s) prevented any representations for such a memorial being received favourably by the Albanian government. Berisha’s presence at this service was not merely, or even nominally, prompted by respect for those who fell in the fight against Fascism. The country only recently (in 2009) joined NATO and when I was travelling around the country earlier this year I came across more British soldiers than I normally do walking around most towns in the UK. Also Albania has applied for membership of the EU (a vain hope, I would surmise) so it pays to keep in well with his masters. I sometimes think that Berisha is so far up the fundament of the west that you can barely see his shoes. His promotion of the return of the remains of the dictator and collaborator, who made the country no more than a vassal state to Italian Fascism in the 1920s and 30s, Ahmet Muhtar Bej Zogolli (King Zog I) certainly doesn’t mark Berisha down as a staunch anti-Fascist. The ‘celebration’ of this return to the homeland was to take place less than a week later. But there is one aspect of the this British War Grave that is different, I would suggest, from any other similar place in the world. I alluded to this situation in my earlier post on the present location of Enver Hoxha’s remains. And this revolves around the red marble memorial stone which is the centrepiece of the cemetery. 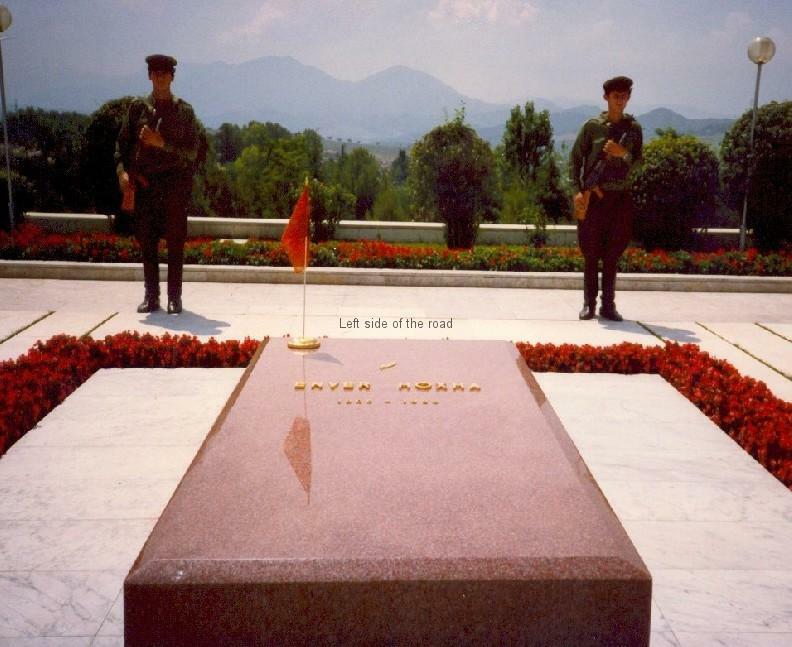 Enver Hoxha’s tomb was originally to the left of the huge Mother Albania statue in the Martyrs Cemetery which overlooks Tirana, a short distance from the city centre on the road to Elbasin. His remains were exhumed in 1992 and he was reburied in the city’s main cemetery on the western outskirts of the capital. Now I’ve read in a couple of places of the ‘grandiose’ nature of his tomb. Now one person’s grandiose is another’s modest. 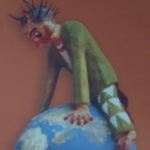 Have a look at this image taken before 1992. Now have a look at this picture of the British memorial stone. What about this close up? What are those holes in the memorial stone? 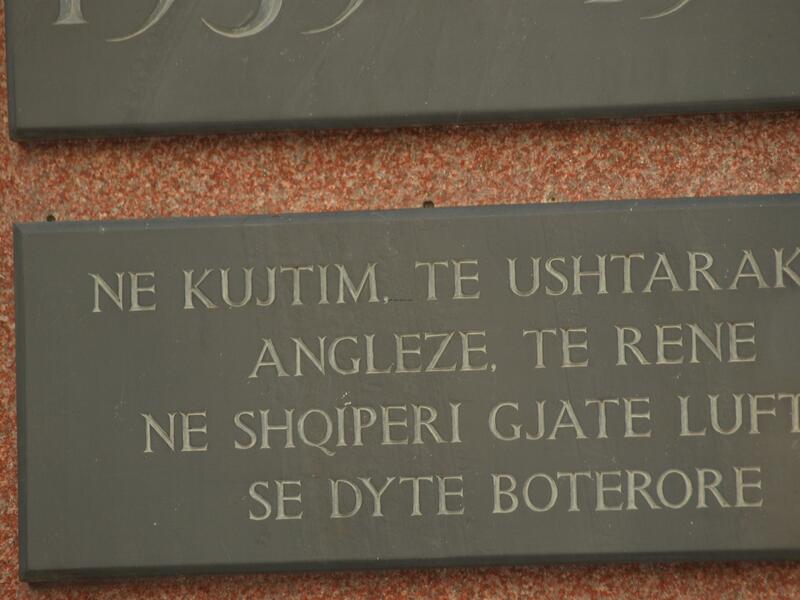 This is Enver Hoxha’s original tomb stone, the holes being where his name would have been originally! Now I’m all for recycling but this is the first time I’m aware of such conscientious re-use of a slab of marble. This is even more so the case in a country where the Albanian for recycling is ‘throw any rubbish wherever you like, preferably a water course’. Why was this piece of stone used in this way? Did, or even does, the Commonwealth War Graves Commission know about this? They don’t say anything on their website. Was it something like the Catholic Church’s use of Christian religious symbols in their destruction of indigenous religions in countries like Peru, the so-called ‘extirpation of idolatry’? Was it to demonstrate to the British Government that after all their attempts to destroy the Socialist society from 1946 onwards that they had finally succeeded? Was it because the country was so strapped for cash that they had to look for a second-hand memorial stone? 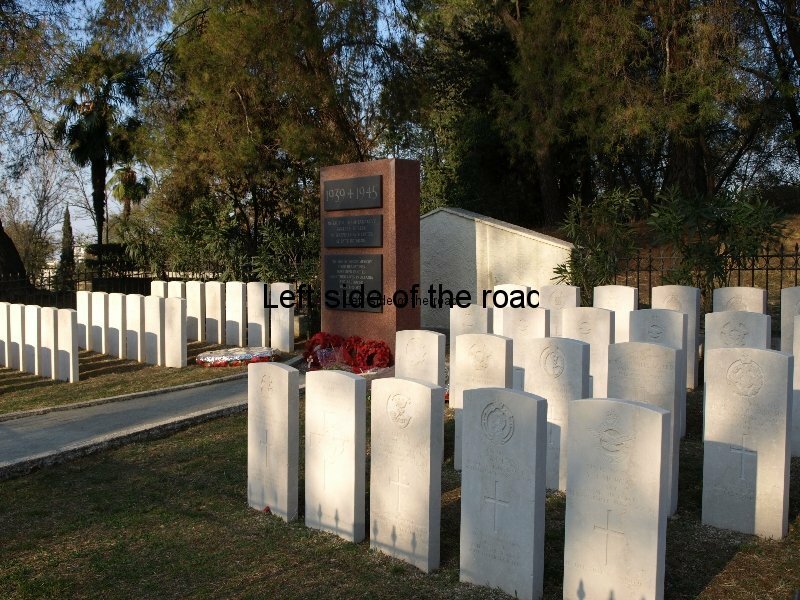 Is it meant to be a sign of respect towards the British dead? Or not? This just seems to me to be a little bit bizarre. 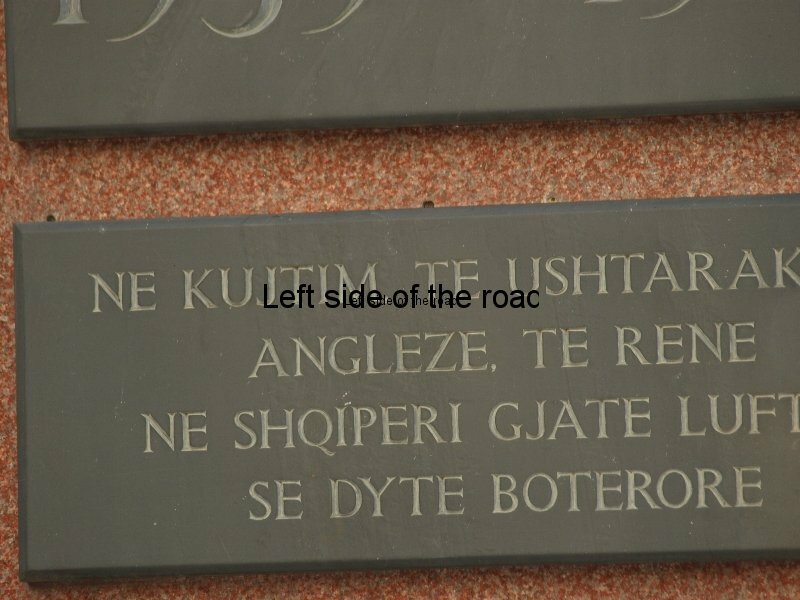 This entry was posted in Albania, History, Travel and tagged british war cemetery, commonwealth war grave tirana, enver hoxha by Michael. Bookmark the permalink. I was the British Defence Attache based in Tirana between 2005-2008. Certainly while I was there Remembrance Services were annually held at the Memorial Park with good international attendance and representation from the senior most figures in Albania. Unfortunately, in my opinion, a decision was made to greatly reduce the number of attaches worldwide and in the case of Albania after I left representation was made from the attache based in Italy. I will say no more. I am now out of touch but heard a rumour that this decision might have been changed from last year. I continue to have a deep love and fascination for Albania. 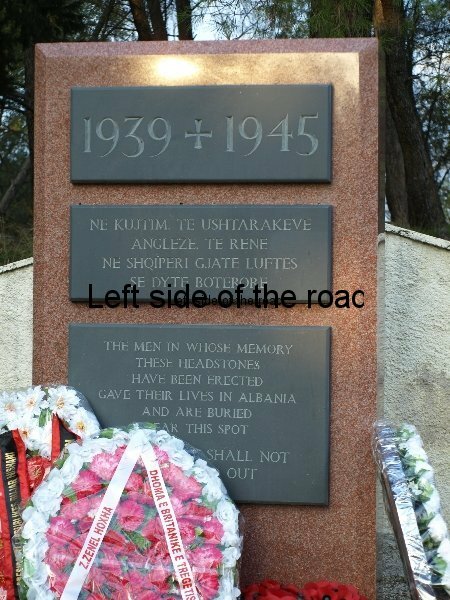 I have heard many comments about the rights and wrongs about what happened in Albania during WW2, from all sides, some expressed to me with great emotion and passion. The truth is that the complexities of the actions, from all sides, who did what and who didn’t, for what reasons, with short or long term objectives, are considerable and quite typically much easier for us to criticise in the comfort of our armchairs 70 years later. What is certainly true however is that, at an individual level, immense bravery and determination was shown by some, Albanians and British (and others), and I am full of admiration for them, if only we can strip away the politics. ‘If only we can strip away the politics’? Not something that can be done when we are talking about wars. I agree that many brave men and women fought (and too many died) in the fight against Fascism. The added complication with the Balkans was even though British service personnel were sent to those countries occupied by the Fascists to ‘help’ those local partisans fighting against the invaders they were also there with a sub-text (even if not known to themselves at the time). And that was to attempt to promote British imperial interests after the war – this especially so when the defeat of Fascism was only a matter of time after the Red Army went on the offensive and pushed the Nazi’s out of their country. This is especially evident in the British support for the Greek Monarchists in the Civil War. 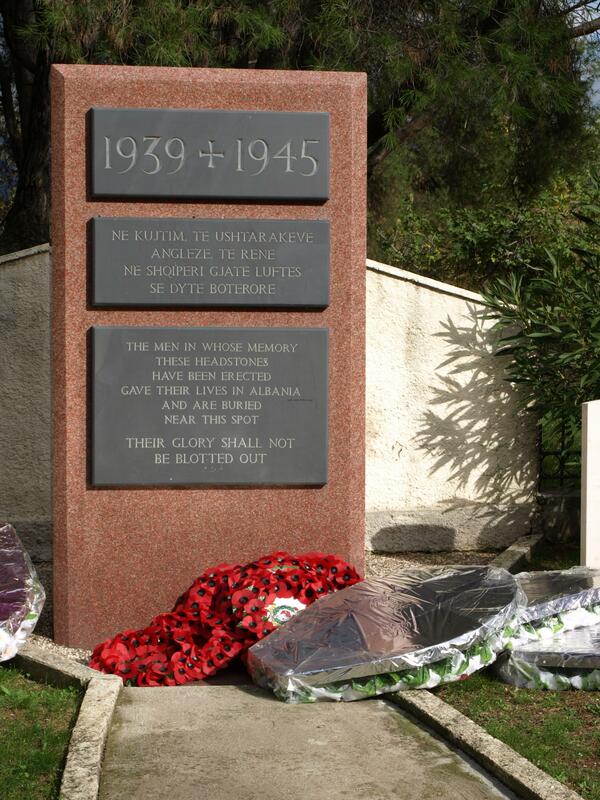 British military personnel and equipment (which only a matter of months before were in action against the Nazis) were used against those partisans who had fought the Fascist in Greece and in support of those who had collaborated with the Fascists. The British supported victory of the Monarchists led to almost 30 years of on off fascist and military dictatorship of the country. The people fought a foreign fascist only to be dominated by a home grown version. This, not surprisingly, had an effect upon the thinking of the Albanian people. I went into some of these issues in my blog on British interference in Albanian affairs and the so-called Corfu Channel Incident. And recently, you might have heard if you are now back in the UK, their have been a number of programmes on Radio 4 telling the story of the British and American attempts at ‘regime change’ (before the term was coined) in Albania. The stripping away of any independent military force in Albania and its replacement by a foreign, NATO force has only served to confirm the long term ambitions of the British, in concert with other western capitalist powers. Between July 1999 & June 2001, I was part of a WEU Mission (Multi Advisory Police Element -MAPE) working in Albania. I am not sure whether it was November 1999 or November 2000 ( I was home on leave at the time ) but a number of British Police officers held a Remembrance Day service at the cemetery. I visited the cemetery a couple of weeks ago and it was good to see that it was now being well looked after. Just having a nostalgia moment when I saw this entry. They had a service both years. I attended both. Intending having a revisit my self. What changes have happened. Have the roads improved? Trust you’re in good health.